Join fellow skaters at the Nottingham Hackspace Skatenights. Watch skate videos and films, do board maintenance, and thoroughly utilise the Hackspace for skating fun. Whether you’re just starting out or you’re been skating since the 80s, we’re a friendly place for skaters of all types to come hang out and shoot the breeze. Skatenights run every first and fourth Tuesday of the month, from 6pm onwards. Hackspace members and non-members are welcome – and if you’re not a member, you can get a tour of the space as well. 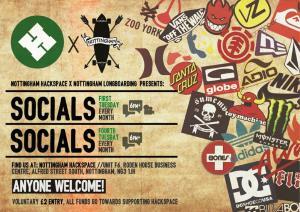 To find out more, check out Nottingham Longboarding on Facebook for more details on upcoming events.